Oklahoma school leaders called on lawmakers Thursday to embrace a new vision for public education that focuses on research-based policies to improve student achievement and values the input of school and community leaders. 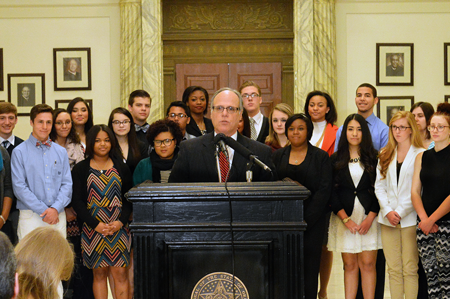 For the People: A Vision for Oklahoma Public Education is the result of two years of study and research by more than five dozen school administrators and school board members, representing CareerTech and urban, rural and suburban districts. The initiative seeks unprecedented collaboration among educators, policymakers, families and communities at the state and local levels. 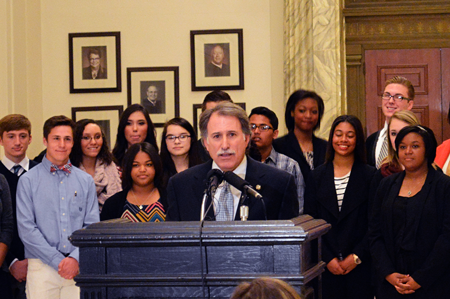 “Oklahoma’s children need and deserve a public education system that delivers on the promise of a superior education for every child,” said Norman Public Schools Superintendent Joe Siano, who served on the initiative’s steering committee. Specific recommendations for state policy include addressing the teacher shortage through improved preparation, support and compensation for teachers; an increased number of school days; and development of a sustainable funding plan that allows schools to focus on long-term planning. For local school districts, For the People calls for local school leaders to engage their communities to build on strengths in the seven key topic areas and create plans to address weaknesses. Some of the local recommendations include more individualized learning opportunities, assessing and improving the quality of after-school programs and creating public-private partnerships to provide additional learning opportunities outside of the school day. Siano, who is past president of the Cooperative Council for Oklahoma School Administration, urged lawmakers to focus their immediate efforts on developing multi-year plans for addressing the teacher shortage and an overall school-funding plan. Oklahoma schools started the school year with more than 800 teaching vacancies. Budget challenges and increasing enrollment over the last several years mean schools receive less funding per-student than they did in 2008 despite increasing costs. Siano said too many districts are struggling to find well-prepared teachers and are forced to increase class sizes, hire teacher candidates who may not be fully prepared and, in some cases, cancel classes. Districts also struggle to enact long-term improvement plans without certainty future funding will exist to see the plans to fruition. Dr. Floyd Simon Jr., a longtime member of the Clinton Public Schools Board of Education and president of the Oklahoma State School Boards Association, said he’s hopeful state-level policymakers will embrace the idea that those working closest with children have the expertise and commitment to do what’s best for children and drive improvement. 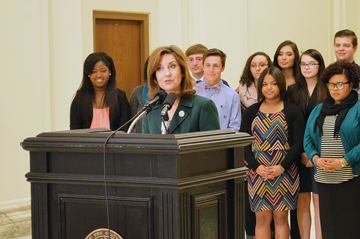 State schools Superintendent Joy Hofmeister expressed her support for the initiative’s goals. The Oklahoma State School Boards Association and the Cooperative Council for Oklahoma School Administration coordinated the initiative with support from the K20 Center at the University of Oklahoma. OSSBA and CCOSA are providing training and support for members to help schools implement key recommendations in the project.